Getting frustrated with the tangled hose in your yard? It can sometimes cause injury and not to mention that it doesn’t look attractive in anyone’s property. Hence, you should consider buying the best garden hose reel instead. The garden hose reel will tidy up the tangles of your hose reel in a stylish way. Hence, for every homeowner out there, we’ve created a list of the top 10 best garden hose reels that you can buy in the market today. Check out the following products and each feature that will help you to tidy up your little garden. We will start with budget-friendly products from Suncast. This 125-foot capacity hose reel in Java color is a water-powered automatic reel system. It also features hands-free rewinding at the flip of a lever because the water pressure will rewind the hose automatically. And it can accommodate the standard vinyl hose capacity. The Smart Trak hose guide winds hose evenly, and its durable resin construction is built to last for a long time. It includes leader and discharge hoses. No more winding, battery consumption, and complicated installation anymore. Assembly is no longer required for this product. It’s ready to use straight out from the box. Buyers can enjoy up to three-year limited warranty upon purchasing this product. 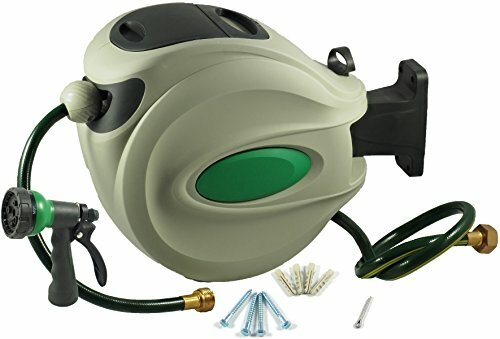 Next, we have the multi-directional garden hose reel from Liberty Garden Products. 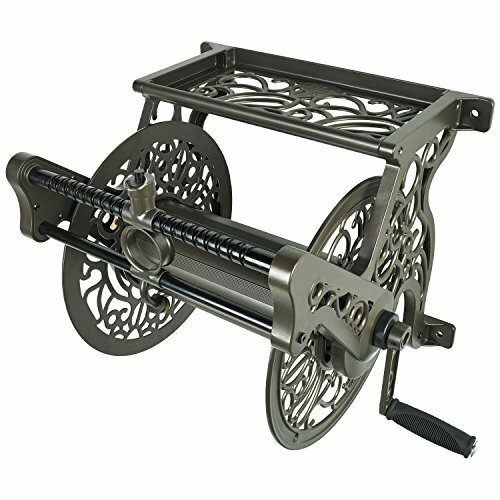 This reel can accommodate up to 125 feet of hose. 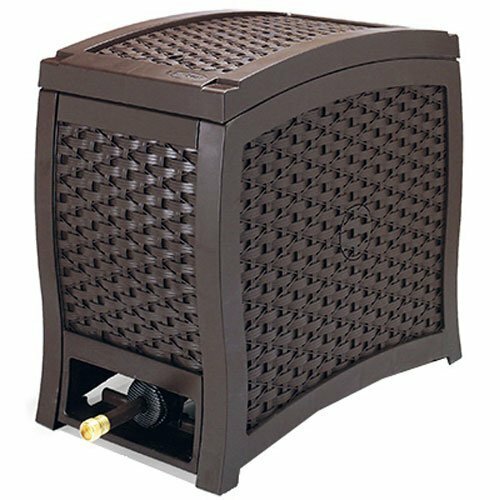 Its 18-gauge steel construction with durable bronze powder coat finish is durable and can withstand harsh elements when placed outdoors. The product also features a pull-up knob for full 360-degree reel rotation, making hose management a lot easier. The storage tray is intended for your nozzles and other accessories. It has a 90-degree solid brass swivel that prevents hose damage, brass, and galvanized fittings to last for a long time. Similar to the previous product we’ve reviewed, it comes fully assembled so you can use it right outside the box. For those who are looking for retractable garden water hose reel, you might want to check this product from Ikris. The package includes a pre-installed automatic rewinding and reinforced PVC hose with top-grade threaded brass end fittings. The retracting SmartPath guide will level the hose reel automatically while rewinding that can prevent uneven overlapping. Thanks to its 180-degree swivel mount and the removable case for winter storage, you can make the most out of this product. It also locks to stop at any length, all you need to do is pull until the desired length and gently release. The package includes a starter nozzle, mounting hex lag bolts, bolt mounts, and pre-installed 120’ hose. You can also remove the access panel for quick and easy clean-up of the product. 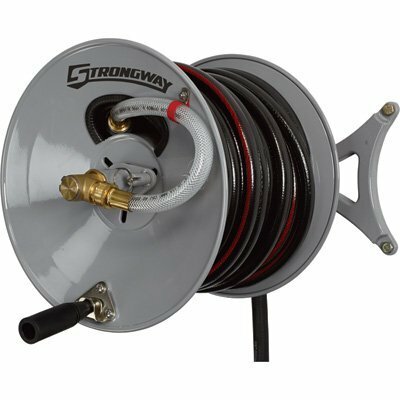 If you are looking for a heavy-duty hose reel, you might want to check out the Strongway parallel wall-mount garden hose reel. You can mount it parallel or perpendicular to the wall, depending on how you like it. For added durability, the product is powder-coated. Rated at 150 PSI for use with any municipal water source, ensuring you the safety of your family members when using the product. You can set it up in right or left-hand-friendly orientation. The package includes a 6-feet long rubber connection hose for quick and easy set-up, brass fittings, and mounting hardware. This is a great package deal without having to break your bank. Next, we have the Roughneck hose reel cart. 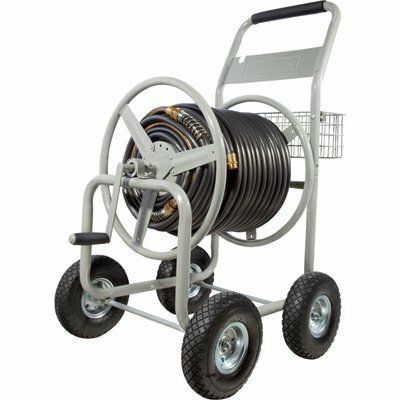 Should you want to transport your hose reel from one place to another, this might be the product that you are looking for. It is made of a durable tubular steel frame that can last for a long time. Thanks to its 10-inch flat-free tires and solid axles, you can roll it smoothly even in the roughest terrain. 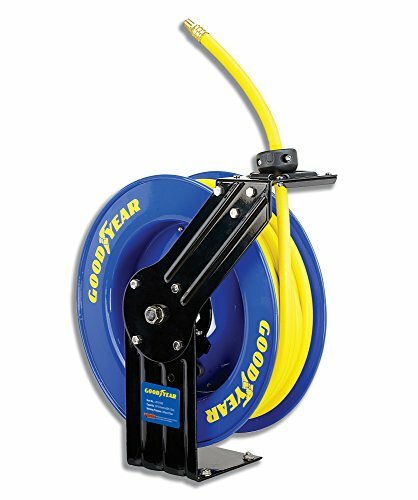 This hose reel can also accommodate up to 400-feet of 5/8-inch hose. There is a built-in basket for store accessories. The heavy-duty brass fittings and couplers also add to the durability of the product. With proper use and maintenance, rest assured that it can last for a long time. If you have enough budget, check out this multi-directional garden hose from Liberty Garden Products. It can accommodate up to 150-feet of 5/8-inch hose. 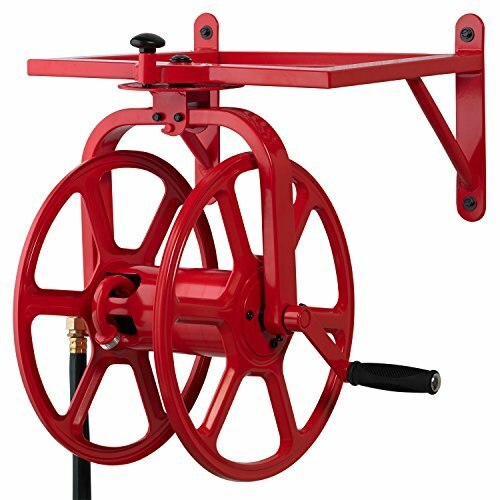 The hose reel features 24 locking positions, 90-degree solid brass swivel, and attachable crank handle. You can enjoy effortless un-winding pull-knob for full 360-degree reel rotation. An integrated storage tray is designed for your nozzles and other accessories. Rest assured that its 18-gauge steel construction with durable powder coat finish can withstand outdoor use. No assembly is required upon arrival of the product however the mounting hardware is not included. Goodyear is known for manufacturing high-quality products when it comes to outdoor equipment for home and commercial use. This hose reel is suitable for compressed air and water usage. Thanks to its well-thought design auto-guide rewind system, rest assured that it will retract smoothly without any kinds. It also features an upgraded ratcheting and double adjustment enclosed spring function that allows you to lock the hose at any desired length. The reel and single axel are covered with powder coated ribbed steel that can resist rust and corrosion in the long run. The package also includes a hose inlet connection to prevent water leakage. Now you can enjoy continuous fluid flow with this product. It’s easy to assemble and mount. Another product that we’re going to review from Liberty Garden Products is the decorative wall mount garden hose. Who says you can’t wind your hose in style? This hose reel is both stylish and functional. The handy hose guide will roll in ease and unrolls smoothly. It can accommodate up to 125-feet of standard-sized hose. The main material for this hose reel is cast aluminum with powder coated finish that’s resistance to rust and hard water. Similar to the other products from the same manufacturer, it also features an integrated shelf for your garden tools and nozzles along with a 5-feet leader hose. Another retractable hose reel in our list is from the GartenKrat. You can quickly remove the unit when not in use for compact storage thanks to its quick-release mount and handle. The Italy-imported fitt reinforced hose is superior in durability and can withstand even in harsh environment. It also features a free lock that allows the hose to stop at any desired length. The package includes the spray nozzle and mounting brackets that allow you to swivel up to 180-degrees. This product may be a little costly, but the mounting kit is already included, allowing you to save money in the long run. 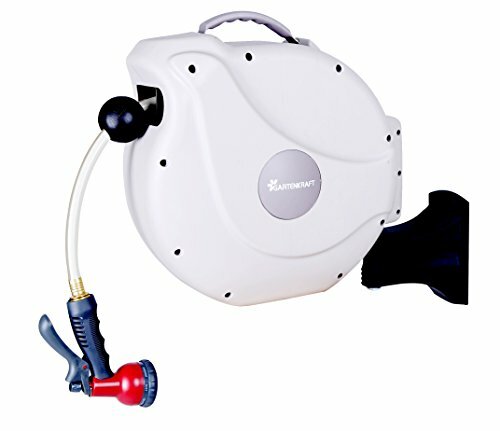 Lastly, we have the water hose reel from Giantex. If you are looking for the perfect hose for yard water planting, you might have found what you are looking for. In hunter green color, this reel is made out of tubular steel with powder-coated green to resist rust and corrosion. The unit can hold up to 300-feet of 5/8-inch water hose. It also features 10-inch leader hose and a reel cart that can run smoothly even in rough pavements. Rest assured that you can carry it anywhere you want as it only weighs 29.0 pounds. It’s easy to use and assemble. 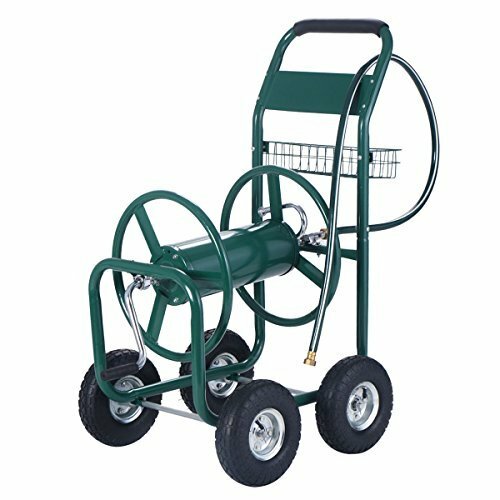 This hose reel cart can serve you and your garden for many years to come. Garden hose reels are designed to keep the hose organized and your garden tangle-free. Most homeowners invest in a garden hose reel to keep their garden clean and also to protect their tube from being damaged due to exposure of the harsh elements outside. Why Should You Buy a Garden Hose Reel? Increases the safety in your garden. The main advantage of having a garden hose reel is the increased benefit that it can provide. A messy hose sprawl over the lawn can make anyone trip. It is also essential to have especially if you have a young child who likes to play a lot out in the sun. It is convenient. Another benefit of having a garden hose reel is the convenience that it can offer. In that way, anytime you want to use the hose, you can easily access it and store it afterward when you’re done using. No more annoying knots and tangles to deal with! It increases the lifespan of your hose. If you want your garden hose to last for a long time, you should consider a garden hose reel. It can prevent damages and leaks to your hose by protecting it. It also reduces the signs of using that is most present in unkept hoses. Wall-mounted Hose Reel- this is the most traditional form of hose reels in the market. It is ideal, primarily if you have limited space in the market. All you need to do is drill the garden hose reel, and it’s ready to use. 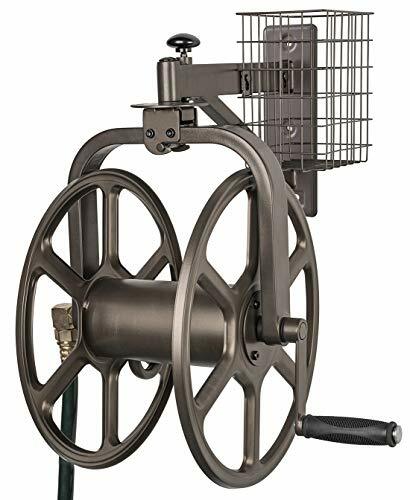 Horse Reel Cart- this type of hose reel is an ideal choice if you have a rather spacious yard and you’re moving long, thick hoses regularly for your garden chores. Retractable Hose Reel- this hose reel is also known as automatic garden hose reel. This is a perfect choice for gardens that are exposed to harsh weather. It also keeps your garden kept and tidy. Metal Hose Reel- if you want a garden hose reel that can last for a long time, this is the most suitable choice for your needs. It can withstand the harsh elements of nature, and its resistance to rust ensures you years of services. Before anything else, you might want to take a look at the length of the hose you already have. For instance, if you own a rather long hose, then you might need a bigger and heavy-duty garden hose reel that can accommodate it. As mentioned above, if you want to have a durable garden hose reel that can last for a long time, you might want to invest in a model that is made of quality stainless steel. It’s a pain to keep on changing your garden reel hose now and then. Your garden hose reel should be able to give you the mobility that you need when it comes to doing your garden chores. You can choose between a portable garden reel hose that you can place anywhere or a wall-mounted garden reel hose fixated in one place that provides undefeated stability. In choosing, you should consider the garden that you have. For instance, a portable garden reel hose is more suitable for use to a larger garden than models that need to be mounted on the wall. Lastly, you should consider the reputation of the manufacturer you’re investing from. You might want to buy a garden hose reel from a reputable manufacturer that can provide excellent customer service when necessary. Checking out the reviews of the past customers is a tremendous help to be a judge of one’s company and their services.